After a day exploring our stunning island, you can look forward to returning to the B&B to unwind. Take a nap before sampling the night life or relax for the night in sumptuous comfort. 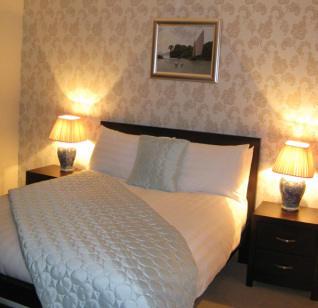 Rooms are all beautifully decorated and tastefully furnished. Each room is individually finished to a high standard reflecting the attention to detail that we have put into our guesthouse. Enjoy the stunning views from each bedroom. The Atlantic Ocean laps the garden to the rear. The majestic mountain of Slievemore dominates the view to the west and Nephin Beg Range to the east. Fall soundly asleep in sheer comfort and calm whilst listening to the sound of the ocean waves. We provide quality linen, towels and toiletries. Watch multi-channel television, free Wi-Fi available throughout house or browse through our library of books to read while you stay. Bedrooms are serviced every day. We provide a selection of complimentary teas, coffee, hot chocolate and snacks, whenever you would like, throughout the day. We endeavor to satisfy our guests with any requirements they may have while staying at Achill Water's Edge.